Chicken Wing contest, live music & food trucks! This could be your event! The Chicken Bandit Food Truck & Catering is one of the preferred caterers at The Red Mill Inn. Wedding receptions, private parties, showers , business lunches and more. Call the Chicken Bandit @ 315-278-3536 (Cindy Baker) or the Red Mill Inn at 315-635-4871 for more information. The annual Va Va Bloom Garden Show at Dickman Farm Gardens! Craft Vendors, live music and food Trucks. The Chicken Bandit Food Truck will be there! Find that new job andget a great bite form the Chicken Bandit Food Truck! Ruston Paving Recruiting Open House! Apply for a job at Ruston Paving and get a free lunch from The Chicken Bandit Food Truck! The Chicken Bandit Food Truck will be serving at the Holiday Festival Craft Fair at Cayuga Community College on December 1st & 2nd. Live Music, craft vendors and some great food to start your holiday shopping! Students!, Faculty & Chicken lovers-at-large Come get some Chicken Bandit! We'll be at Harrison Hall (1320 Salt Springs Road, Syracuse 13214).October ,19 & 26th from 5PM-8PM. .
Join us for live music, food trucks and a ton of fun! the Chicken Bandit will be serving Vegan & Vegetarian Nachos, 2pc Bandit Seasoned Chicken, Korean BBQ Chicken Tacos, Mexican Lime Garlic Chicken Gyros (and Nachos). Students!, Faculty & Chicken lovers-at-large Come get some Chicken Bandit! We'll be at Harrison Hall (1320 Salt Springs Road, Syracuse 13214) August 31, September 21, September 28, October 5, 12,19 & 26th from at least 6PM-9PM. We may adjust the times we're there to a longer period if the demand is there. Join us for the Lynard Skyard concert and get some great Chicken Bandit Food Truck eats! The Chicken Bandit Food Truck will be there! Buried Acorn Brewery & the Chicken Bandit Food Truck! Get a cold brew and some great street food from the Chicken Bandit Food Truck! Celebrate July 4th with Symphoria and the Chicken Bandit Food Truck & Eatery! Fireworks,too! The Chicken Bandit Food Truck will be serving at the Steely Dan concert! The Chicken Bandit Food Truck will be serving at the Paramore concert on June 17! Imagine Dragons at the Lakeview Amphitheater! The Chicken Bandit Food Truck will be serving at the Imagine Dragons concert on June 11! The Chicken Bandit Food Truck, Birdsong Cafe, Limp Lizard, Skippy's Ice Cream and Papa Gallo food trucks will all be there! Get some great food and watch the competition! 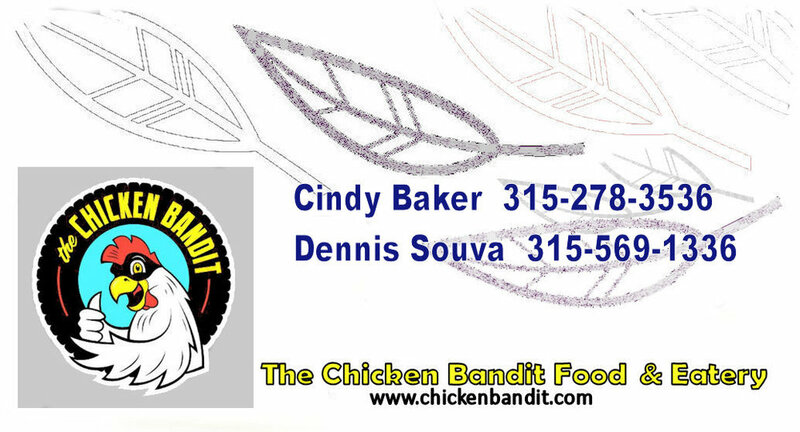 The Chicken Bandit Food Truck will be serving at the Kenney Chesney concert on June 7! Dave Matthews Band in Concert! The Chicken Bandit Food Truck will be serving at the Dave Matthews concert on June 5! The Chicken Bandit Food truck & Eatery will be at "What The Truck" every Tuesday from May 15 until August 28, 2018. Mother's Day at Sycamore Hill Gardens! Join us at Sycamore Hill Gardens for Morher's Day. Tour the beautiful gardens and grab some great food from the Chicken Bandit Food Truck & Eatery! All for the benefit of the Baltimore Woods Nature Center. Food Truck & Craft Beer Festival! Food Truck Festivals of America presents the 3rd Annual Food Truck & Craft Beer Festival. The Chicken Bandit Food Truck & Eatery will be there! The 12th Annual Wildlife Festival, Live Animal shows, Live Music, The Chicken Bandit Food Truck & Eatery, Guided Tours,Family Entertainment and Children's Activities! Food Truck Rodeo with Shattuck's Paddy Wagon, Toss 'N' Fire Wood Fired Pizza, Byblos Street Cafe & the Chicken Bandit Food Truck! Park Point Apartments- Tapingo Event! Download Tapingo, create a profile and order a free food voucher from the Chicken Bandit Food Truck & Eatery! WT Brews & the Chicken Bandit Food Truck! WT Brews Company and the Chicken Bandit Food Truck & Eatery are joining forces April 28th to bring you some great brews and some delicious street food!. The Chicken Bandit Food Truck & Eatery along with Skippy's Ice Cream will be serving at Station 3, Moyers Corners Open House. The Middle Ages Brewing Company and the Chicken Bandit Food Truck & Eatery are forces April 21st to bring you some great brews and some delicous street food!.